Monoprinting is a form of printmaking that produces unique and unexpected results which can range from a bold statement to a ghostly impression. The process allows for considerable freedom in the approach to creating imagery. As monoprinting is a great way of encouraging people to work quickly and loosen up their drawing skills, the first half of the session will be spent drawing from the mannequins and liberty collection in the LIBERTY Art Fabrics & Fashion exhibition. Then these image will be used to create a series of line drawn monoprints. In the second half of the session these line drawn monoprints will form the starting point for the creation of a colour mono print. After a short colour mixing demo you will begin working directly onto the printing plate, building up your image in a painterly way by continually adding colour. When you are satisfied a print will be taken. 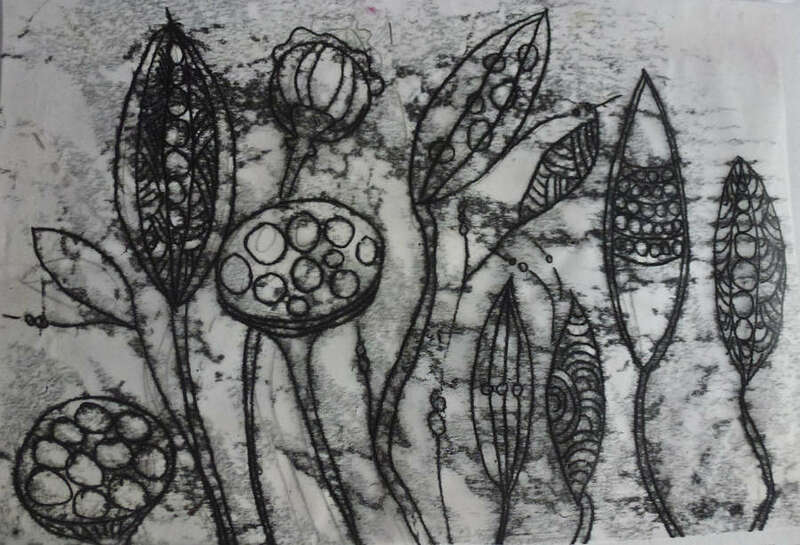 This is simple, spontaneous and a fun way to introduce yourself to printmaking, Come and explore the incidental qualities and textural possibilities of printmaking and how it can give your drawing and painting a new twist. This workshop is hosted by Jill M Boualaxai, a multi media artist based in Edinburgh, Scotland. Jill is founder and tutor of Look and Draw workshops which provides a structured and supportive teaching environment that aims to inspire and challenge through a year round program of exciting and innovative art classes and workshops.